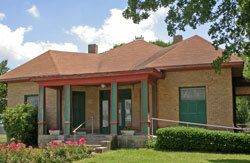 to build for the future"
Welcome to the Hopkins County Museum; maintained by the Hopkins County Historical Society. 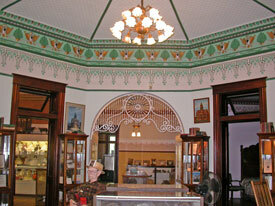 The Museum itself features many unique design elements, including carved columns and an unusual Regency-style spherical ceiling rising from four spindled arches. 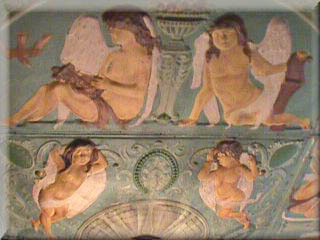 The central room has a painted Dome ceiling with an Eagle motif. The Museum is built of double brick walls inside and out, with the brick coming from the brick plant that once stood near the back of the property. Each room has a separate foundation as well as a pressed tin ceiling. All of the ceilings are original, with the exception of the one in the Maddie May Long room, which came from the Opera House. 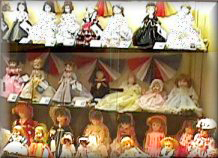 The families of Hopkins County have donated all of the items used in Museum's displays, including this doll collection, as well as miniatures of prominent local buildings like the courthouse. 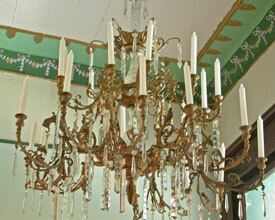 This spectacular crystal chandelier once hung in Maximilian's palace. It is now one of the prized historical artifacts on display at the Museum. Explore displays of period apparel, Civil War memorabilia, Caddo Indian relics, and many other pieces of Hopkins County history.